It’s hard to pick just a few favorite songs from Ratatat. I was introduced to them from a friend, and been listening since. 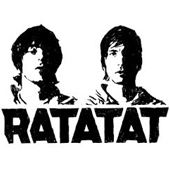 Ratatat (pronounced rat-ə-tat) is a New York City experimental electronic rock duo consisting of Mike Stroud (guitar, melodica, synthesizers, percussion) and producer Evan Mast (bass, synthesizers, percussion).